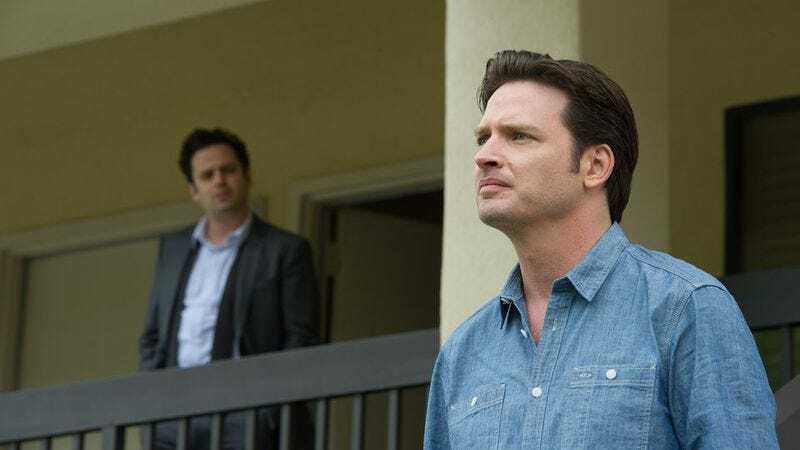 Variety is reporting that there’s only one more season left of Rectify, SundanceTV’s dark examination of justice, family, and loss in a small Georgia town. Starring Aden Young as a man released from prison after serving 19 years on Death Row, the show will have just a few more episodes—six, if the past is anything to go by—to wrap up its winding, philosophy-laden plot. Or maybe not: creator Ray McKinnon seemed as sanguine and soporific as one of his characters as he contemplated the show’s end, saying, “I have always felt that Rectify could end at any time or just as easily continue. Well, not easily. But there is no perfect ‘end’ for this story, nor for these characters. They will continue to live on. We just won’t document them any longer.” McKinnon also said the timing of the show’s conclusion “feels exactly right,” presumably because it gives him plenty of time to figure out the perfect way to keep the question of Daniel Holden’s guilt completely and maddeningly ambiguous throughout the rest of time. Rectify’s final season will air on SundanceTV, some time in fall of 2016.